It was due for some time now and Google has finally delivered. 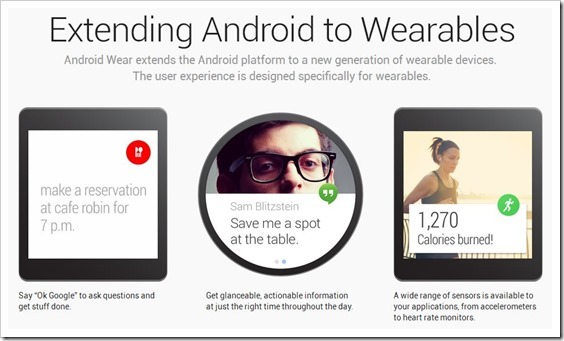 Like it had done with tablets, Google is bringing a separate version for Wearable devices. While Honeycomb was eventually merged in the Ice Cream Sandwich and the two OS systems became one, it is unlikely that it will happen with this anytime soon. Android Wear is made from ground up with one thing in mind – Lack of screen space on wearable devices. Most wearable devices like watches have very small screen which do not provide a lot of flexibility. It’s not like you can play a game of angry birds on that small a screen with the element of fun remaining intact. Android Wear took a lot of time to come into the fore (Samsung has released multiple versions of its wearable watch and so has Sony) but is coming from Google itself. The company has gained a lot of experience on the wearable devices with their Google Glass doing rounds with lots of feedbacks coming from all directions. As is expected, Google Now is the base on which Android Wear stands. Google Now provides nuggets of information at the right time and as most information doesn’t require a lot of space to be displayed, it is perfect for a watch or any other wearable gadget. Besides, Google Now has become increasingly efficient and as most users can vouch, has become an essential, if not integral part of daily information source. With the introduction of Cricket Cards, Google Now really has gained a lot of standing in the Indian mobile space as well. Also, with notifications improving on Android with every iteration, Google can bring in developers to focus on making the experience better by just improving the notifications. Android Wear supports Rich notifications and is also introducing a developer preview of its Android Wear SDK. With the help of this SDK, developers will be able to improve the notifications and customize them according to wearable gadgets. New APIs will come into existence making the whole experience of developing for the wearable gadgets smoother. This would make it easier for developers to deploy the right apps (or in this case notification update) and thus make the adaption faster. Getting notifications on the gadget directly. Info that you need is already present when you need it (Google Now). “OK Google” comes to your watch! Information related to health like running and walking to improve upon your health. Controlling other gadgets like music playlist on phone or tablet or acting as a remote for Android TV and probably every electronic device in home in future. Companies like Asus, HTC, LG, Motorola, Samsung are already working with Google on this. Also, Broadcom, Intel, Mediatek, Qualcomm, MIPS and Fossil Group are in the loop. So, basically Google is trying to rope in everyone Android for this project. A few devices like LGs “G Watch” and Motorola’s Moto 360 are even teasing around the corner and might be in hands of people sooner than later. Only time will tell whether Google has hit the nail on the head but as of now, the prospects look bright for Google. With nearly every major manufacturer now betting big on wearable computing and introduction of “Android Wear”, this space is sure to see lot of activity in coming days!